Training and competition increases the nutritional requirements horses need to stay healthy and at their peak of performance. 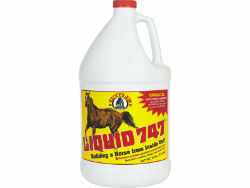 Tuttle's Liquid 747® is composed of all natural ingredients that are easily utilized for maximum feed efficiency. Our highly palatable apple flavored liquid supplement aides in balancing your horse's diet for optimum development, stamina, and appearance. Apple flavored base of cane molasses and corn oil packed with calories for energy and appetite enhancement to assist with weight building and conditioning. For general horse care, 1 fluid ounce (2 tablespoons). For horses in heavy training, stallions, brood mares and large draft horses, 2 fluid ounces (4 tablespoons). For foals and miniature horses, 1/2 fl. oz. (1 tablespoon). Cane Molasses, Water, Brewers Dried Yeast, Corn Oil, Whey Protein Concentrate, Methylparaben (preservative), Natural and Artificial Apple Flavoring, Salt, Propylparaben (preservative), Sodium Benzoate (preservative), Vitamin A Supplement, Vitamin E Supplement, Lecithin, Zinc Sulfate, Ferrous Sulfate, Monosodium Phosphate, Magnesium Sulfate, Choline Chloride, Polysorbate 80, Manganous Sulfate, Magnesium Limestone, Potassium Chloride, Disodium EDTA, Copper Sulfate, Sodium Bicarbonate, BHT (preservative), D-activated Animal Sterol (source of Vitamin D-3), Inositol, Niacin, d-Calcium Pantothenate, Sodium Selenite, Cobalt Sulfate, Thiamine Mononitrate, Riboflavin, Pyridoxine Hydrochloride, Folic Acid, Potassium Iodide, Vitamin B-12 Supplement, Biotin. Vitamin A 245,000 I.U. 21,240 I.U. Vitamin D-3 24,500 I.U. 2,124 I.U. Vitamin E 480 I.U. 41.6 I.U. Vitamin B-12 103 mcg. 8.9 mcg. Riboflavin 5 mg. 0.43 mg.
d-Pantothenic Acid 26 mg. 2.25 mg.
Thiamine 8 mg. 0.69 mg.
Niacin 34 mg. 3.0 mg.
Vitamin B-6 3.5 mg. 0.3 mg.
Folic Acid 0.3 mg. 0.026 mg.
Choline 440 mg. 38.1 mg.
Biotin 0.35 mg. 0.03 mg.
Inositol 120 mg. 10.4 mg.